Spiezia organics grow all of their herbs and flowers on the same farm in Cornwall they started on 40 years ago. In 1998 Mariano and Loredana Spiezia moved to Cornwall from Italy with their 3 children and set up on an organic farm at St.Martin. The farm owners (Pat and Rex Hoskings) have been running the farm for over 40 years and grow the organic herbs and flowers that Spiezia use for their products. They also run a campsite for people who want to escape their busy lives and enjoy some fresh air! When setting up their company, they decided they wanted to be caring with everything they do: use quality ingredients, use production methods that were non-damaging to the environment and to create simple, natural and highly effective products that help people could use to care for themselves. All of Spiezia’s products are handmade in their workshop at Gear Farm (Cornwall), 100% natural and certified organic by the Organic Soil Association. Their range of natural products include those for the hands, face, bath, hair, men and mother and baby. Cold pressing: Oils are obtained from pressing/grinding fruit and seeds which releases their oils under pressure. Although no heat is used in the process, some is generated through the friction of grinding and pressing. The temperature never rises above 50c in order to preserve the properties of the ingredients. This method is used by Speizia because no chemical by-products are created and the quality of the oil is higher. Maceration: The herbs or flowers can be air dried and each product has a potent area known as the ‘maceration’. These herbs or flowers are put in a glass jar of olive oil and placed in their “maceration room” for 4 weeks. They use solar and lunar energy to draw the essence from the plant and infuse the oil (contracting and expanding from temperature draws out oils). The mixture is then pressed and filtered in order to remove any solid plant/flower particles from the oil. Steam distillation: Steam is used to extract essential oils in order to preserve the active ingredients. This process involves taking the part of the plant you want to extract the essence from and adding water and steam. Adding water and steam lowers the boiling point of the oil, so the oil evaporates before the water. This vapour condenses again and you have your essential oil! Cruelty free – No Spiezia products or ingredients have been tested on animals. 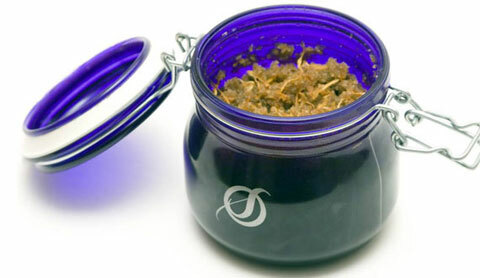 Spiezia use blue bottles and jars for their products. Blue bottles are usually used to protect the ingredients from sunlight.